Charming small villa with garden near to the beach. Betty was a great host and took a lot of care and attention to make sure we were settled on and was always on hand to answer any questions or give advice. The villa itself is exactly like the photos, the garden and terrace are beautifully kept and well equipped for eating and relaxing outdoors. Location wise it is a short (less than 10min drive to all of the stunning chia beaches) and the nearest town, Pula, is about a 20 minute drive. The villa is in a quiet reseidebtial location with lovely views over the countryside but you do need a car to get to shops, bars, restaurants as there is not much within walking distance and the roads are poorly lit at night. Sorcia thanks to Betty for her hospitality! The apartment is very relaxed and stylish, and the kitchen well equipped. The garden and outside space also too is beautiful. Betty is an excellent host. Chia is a small town with many lovely empty beaches nearby. April seemed a good time to visit- not everything was open but the countryside is fantastic. There are several well priced restaurants nearby. The perfect haven in Chia! Quaint and quiet with your own peaceful garden! Conveniently located 10 minutes walk to the beach, mountain hiking or running, and a local grocery store...you can't get a better location without staying at surrounding hotels. Having a private home here was ideal for chilling with friends and exploring the beaches both by foot and by car. Betty and Micky were excellent hosts, going out of their way to get you anything you need and work around your schedule. Incredibly clean and stocked with more than enough towels, blankets and pillows! I hope to visit again one day!!! THANK YOU FOR THE GREAT STAY!!! We had a lovely time and the property was perfect for our family of 4. And Betty is fantastic host! We are definitely going to come back. Schon im Vorfeld wurden wir genau über alles informiert, so dass wir die Unterkunft problemlos gefunden haben. Es handelt sich um eine sehr gut ausgestattete Villa, die kaum einen Wunsch offen liess - und falls doch, hat uns Betty sofort geholfen. Wir haben von ihr auch Informationen über umliegende Restaurants, Läden, Sehenswürdigkeiten und Strände erhalten. Wir haben den Aufenthalt sehr genossen und werden unseren Aufenthalt in Chia in guter Erinnerung behalten. Nous avons apprécié la localisation de la maison, son extérieur fleuri et arboré ainsi que son grand patio couvert. Maison bien équipée. Bon accueil et écoute de Betty qui s'exprime très bien en français. Belle région. Proximité de belles plages. Lovely semi-detached house situated in the beautiful Chia, wherein lie some of the most beautiful and pristine beaches of South Sardinia. The accommodation is nestled in a lush green garden just 800m from the beach of 'The Harbour', in the area of ? ?the Tower of Chia. It grows in hilly slope in a cool and quiet with beautiful views of the mountains to the south-west. Some of the main services such as markets, bars and tobacco, restaurants, pizzerias, picnic area are located approximately 500m and easily reachable on foot. The area boasts many natural attractions besides the beautiful sea, like some lagoons where pink flamingos nest, the mountainous area of ?? 'is Cannoneris', many rural routes (to the lighthouse of Cape Teulada, through the ancient Roman road led to Nora, across the coast up to Tuerredda, etc..). Of acute importance are also the archaeological attractions. Check in: dalle 18 in poi; Check out entro le 9:30. Se la casa è disponibile prima volentieri si concorderà una consegna anticipata. *Consumi acqua e gas completamente inclusi. Elettricità inclusa fino a 25kw/h a settimana. Eventuali ulteriori kw/h sono da pagarsi extra al costo di 0,30€ per kw/h alla partenza. I prezzi indicati si riferiscono fino ad un massimo di 4 persone. 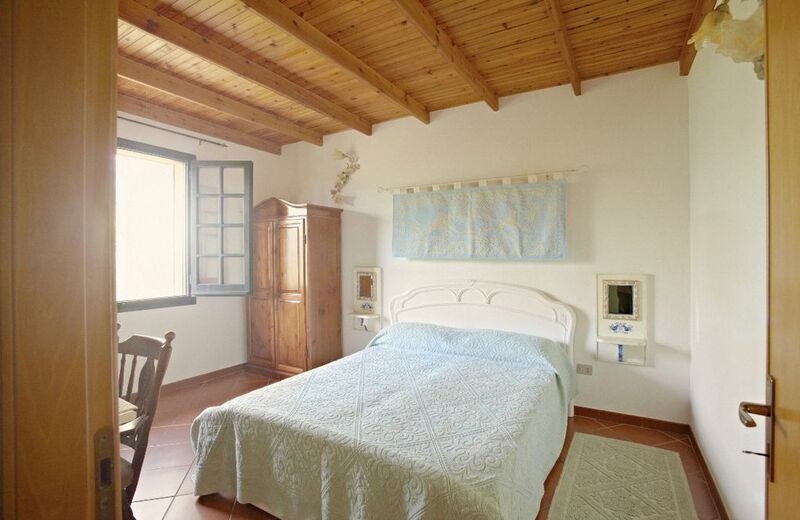 5* letto disponibile con eventuale supplemento. Le pulizie finali comprese nel prezzo non includono la pulizia dell'angolo cottura, dei sanitari e lo smaltimento dei rifiuti. Il servizio può essere richiesto extra al costo di 30€, pena 30€ dalla cauzione. La cauzione verrà resa a mezzo bonifico bancario dopo la partenza. Check in: ab 18:00;Check out: innerhalb 9:30; * Verbrauchkosten Wasser und Gas insbegrieffen. Strom bis 25kw/h pro Woche insbegrieffen. Eventuellen mehreren benutzten Kw/h sind extra im Hoehe von 0,30€ per kw/h am Ende des Aufenthlt zu zahlen. Bettwaesche/Handtuecher/Strandtuecher: 1 Set pro Person insbegriffen. Die Preise sind bis 4 Personen. Extra Leute mit extra Preis.Endreinigung Kosten sind schon im Preis insbegriffen; die enthaelt aber nicht die Reinigung der Kuechenziele sowie die Trennung und Entsorgung der Muell. Dieser Service kann mit einem extra Preis von 30- angefordet werden. Die Kaution wird nach der Abreise uebergewisen. Check in:from 6pm; check out: up till 9:30am* Water and gas consumption charge are fully included. Electricity is included up to 25kw / h per week. Any additional kw/h are to be paid extra at the cost of 0.30 € per kw/h. 1 set of bed linen / bath towels/ kitchen and beach towels is included. Prices up to a max of 4 people. 5 * bed available with supplement. Final cleaning included in the price does not include the cleaning of the kitchen. Please don't leave any rubbish in the house at departure. This service is available with extra charge of 30eu-.. Caution will gived back per banktransfer after departure.